SELECT - Highlighting this row/cell and hitting the controller Select button makes that pilot active and returns one level up to the Personal Preference menu. 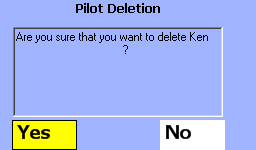 DELETE - The controller left/right buttons allow selection of the Delete function for existing pilot records. The system will display a Delete Confirmation window and ask for verification. 'YES' is the default. 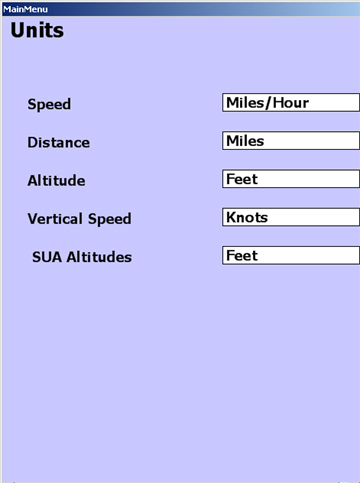 ADD - Selecting the Add function will display the New Pilot Name screen (below) to allow entry of the New Pilot Name. 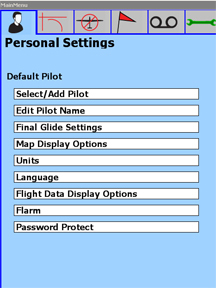 The current active pilot is displayed at the bottom left of the Select / Add Pilot Screen. 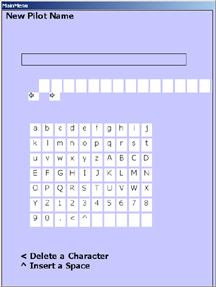 A blank row of individual cells is displayed to capture and manipulate text input. 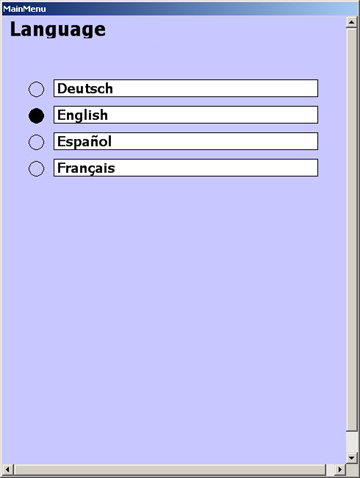 A grid of all available alphanumeric text values is displayed immediately below. Text is 'entered' a character at a time by toggling between the two grids. The location of the active insertion point ... or selected character is highlighted by the system. When you are on the capture row, the hand controller left/right arrows allow you to select the insertion point for the next letter or number. Hitting the controller select button then toggles you to the grid where you can select a letter or number. The system actually adds cells incrementally to the capture row - starting with one cell. The small left/right arrows below the row show how many cells are available. 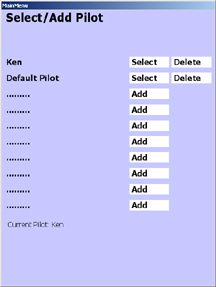 This screen allows you to edit the currently selected pilot name ... 'Default Pilot' in this example. 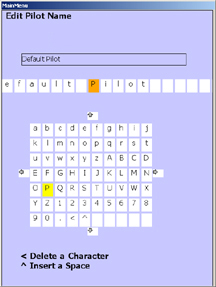 The screen displays a row with the currently selected name - and allows you to delete characters or change text ... selecting from a grid of all available text values. Text is deleted and/or changed a character at a time by toggling between the two grids. The location of the active insertion point ... or selected character is highlighted by the system. In this example, 'P' was selected and the system activated the text selection grid - positioning the highlight to 'P'. You can move to any other value on the text grid using the left/right and up/down buttons - and hit the controller Select Button to accept. 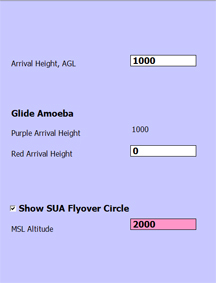 'Arrival Height, AGL' is used by the final glide calculator ... and the calculation engine for the purple amoeba ('Purple Arrival Height'). The purple amoeba shows your glide range in all directions from your current altitude to an altitude equal to your 'Arrival Height, AGL'. As you change the 'Arrival Height, AGL' you will see this value applied automatically to the 'Purple Arrival Height' parameter. No direct modification to the latter is permitted. The 'Red Arrival Height' parameter is used by the calc engine for the red amoeba. This is typically set to zero to reflect real-time glide range to the ground. The ' MSL Glide Range' altitude is used to calculate dynamic glide range in all directions from your current altitude to the entered MSL altitude. i.e. the MSL Altitude represents an operations floor. MSL Glide Range is displayed on the ClearNav Map as a circle (in zero wind) defined by a thin black line. This real-time calculation incorporates glider polar, ballast %, bug %, MC, and winds. 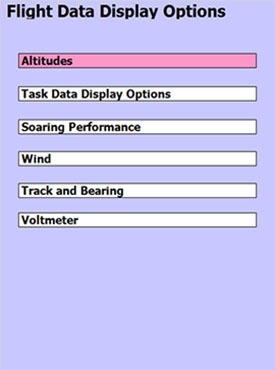 This screen allow the pilot to set the three parameters that are used in dynamic glide range calculations. These real-time calcs incorporate glider polar, ballast %, bug %, MC, and winds. 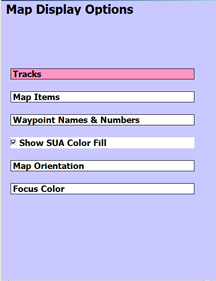 Tracks - allows pilots to display or hide 'ground' tracks. The tracking data is retrained so the pilot can switch this on/off without losing track history. 'Clear' Tracks will erase track history. Map Items - allows pilots to select background features that should show on the moving map. Terrain, Roads, Water Bodies, City Areas can be turned on or off individually. waypoint names / numbers - allows pilots to select Control and Waypoint Name display options. You can display long name or short name with or without the turnpoint number. The short name is five characters long. A black reference sailplane is displayed and track is always upward on the map display. 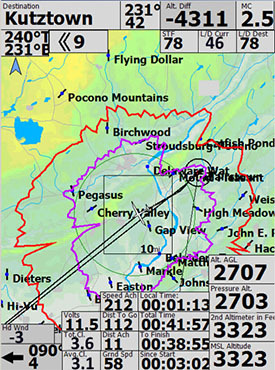 The map terrain features and waypoints rotate under the reference sailplane as heading is changed - matching the pilot's view outside the cockpit. Map rotation is suspended if you hit the controller up, down left or right buttons to move the cursor. The sailplane image will change to the white variant to reflect this state. Rotation will restart if the Select button is pressed - or when the rotation suspense timer expires in ~ 20 seconds. In Track Up mode, the reference sailplane is positioned in the lower third of the display to present the maximum view of terrain and waypoints ahead. Map terrain features and waypoints remain stationary fixed to north - which is assumed to be the top of the screen. The white reference sailplane rotates as heading is changed. The reference sailplane is positioned in middle of the display to present the maximum view of terrain and waypoints ahead with any course change. The TRACK UP mode display will auto-change to North Up when the ClearNav detects the ship is circling. (i.e. an ongoing course change of 20 degrees + per second for more then 10 seconds.) The display will revert to Track Up when circling ends. FOCUS COLOR - allows pilots to select the color the provides the best resolution considering sun glass tint and the ambient light conditions. This function allows you to display additional flight/task metrics on the moving map. All will appear immediately when selected - except the voltmeter display, which will only appear if the voltage drops to or below the designated threshold. The requested parameters will be displayed in pre-mapped locations to group like items together ... i.e. Altitude items will appear in the same column, time items in the same column, etc. The displayed values are not moveable from the the mapped locations. This is the baseline map presented when no additional on-screen items are requested. This is the map generated when all on-screen options are requested. Altitude AGL is approximate and calculated by subtracting terrain elevation from MSL Altitude. 2nd Altimiter in Feet MSL Second Altimiter - Always defaults to MSL in feet. TASK DATA DISPLAY OPTIONS Ground Speed Calculated Speed over Ground. Time Since Start Time since last valid start. Time To Finish is the estimated time (hh:mm:ss) to task finish – calculated by dividing the Distance To Go by the Predicted Speed. Total Time is the estimated time to complete - calculated by adding the Time Since Start to the Time To Finish. Distance Achieved Distance Achieved since last start. Distance To Go is the distance from your current location to remaining turnpoints to the finish point. Achieved Speed is the average speed since the start of the task. Average climb rate in the current thermal. The average climb rate since take-off – or since the last task start . L/D to Destination LD required to reach destination. L/D Current Glide LD acheived in current glide. Speed-To-Fly Units / Hour Speed To Fly - Computed for MC, Wind, Bugs and Ballast. This option allows display of the wind compass directions in degrees magnetic as a numeric value .... in addition to the vector arrow. This option adds Bearing info - to the Distance window at the top center of the moving map. Track Error Deviation from direct track to destination - Degrees. The FLARM options allow the pilot to control the FLARM warning audio and visual displays. Flarm display and audio options are controlled on the first screen. 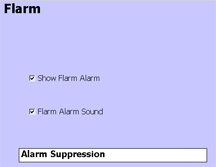 The Alarm Supression options allow the pilot to control the length of the alarm warnings - and the sensitivity threshold.